I was a religious nomad for many years. Although raised in a Christian home, my faith was invaded by doubt shortly after arriving for college. I began to explore different religions and belief systems before coming to an agnostic state. I dwelled there for many years. My revival came in the early years of 2000. I continue to seek answers but understand now that God never intended for us to know or discover everything. Once I stopped boxing in God with secular limitations and accepted His true omnipotence, my battle was over. My ideas are by no means new and my beliefs are as ancient as the Crucifixion, but they make me who I am today. Tony C Today, like the USA Today, is always in color and usually on the lighter side of things. My teenager has been playing on a competitive soccer team now for about 5 years. As for me, I never played the game, much less understood the concept of running around for over an hour to win or lose 1-0 and never legally hitting anyone…but then again, I spent my teenage years banging my head into other teenagers playing the football spelled with two o’s. Point goes to the current day teenager. Playing on a travelling team has allowed us to play in soccer tournaments in other cities and take in the ‘best of’ what the host town offers. 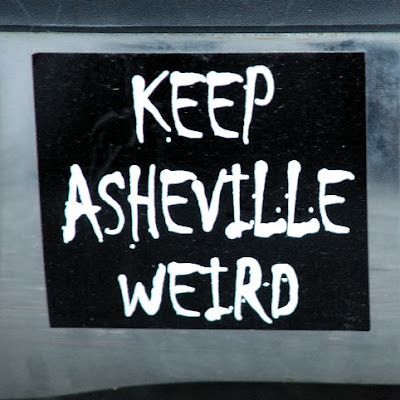 This past weekend was a revisit to the city of Asheville, North Carolina. Our prior visit a year ago was somewhat limited by an eleven month old in tow, so this year Mrs. Tony C wanted to experience the cultured downtown area on a weekend evening and expose our girls to a taste of the artsy side. Now, I know some of you are trying to wrap your head around the words North Carolina, cultured, and artsy all in the same sentence, but downtown Asheville has really emerged as a mixing grounds of artist, musicians, locals and tourist…at least according to a visitor website I looked up. Tony C: Sounds eclectic (eye roll). Mrs. Tony C: I’ll bet the buildings are really old and beautiful. Didn’t you always want to be an architect? Mrs. Tony C: Astronaut…architect…whatever. Sounds like an excellent place to expose the girls to a different cultural environment. Mrs. Tony C: Tony! Don’t start! We have an obligation in the educational process of our girls. We’ll go downtown after the second game and walk around. I heard there’s a great pizza place called the Mellow Mushroom downtown….sound okay? Point goes to Mrs. Tony C.
After conducting a drive-by to check out the downtown scene, I found a relatively close parking spot because it was still early. Navigating the ‘un-renewed’ streets of the downtown area was quite interesting and using the GPS on my Blackberry was no help. Finding our dining destination would require my innate sense of navigation….good thing I was along. So we wondered around aimlessly in the downtown area while I tried to orient my internal compass for over an hour. Along the way, our girls were definitely exposed to a new cultural experience that included new vocabulary words, public marijuana smoking, three exposed breast, an impromptu phallic sculpture, and a crack ho…well…okay, I didn’t actually see the crack, but she left no doubt about the ho part. Point goes to Mrs. Tony C. (for educational experience). Tony C: That’s performance art dear. Mrs. Tony C: That’s welding metal art. Teenager: A.K.A? What’s that? Hey…is that art? Tony C: A.K.A…also known as…and no, that’s a lady breastfeeding…don’t stare. It was about this time I gave up on my internal GPS and asked directions from a lady with more facial piercings than I would have believed humanly possible. We were actually only a block or so away from the Mellow Mushroom…which turned out to be a pretty good place to eat. I was just a little paranoid about the green on top of our pizza, but turns out it was actually just oregano. Point to Mrs. Tony C.
The walk back to the car was a pretty quick pace…especially when stuffed with pizza and soda. The two year old was completely worn out from a day in the sun, as was the teenager from a day on the field. I suddenly realized there were very few other people with strollers…very few…and all of them had the same look of astonishment I’m sure adorned mine and my wife’s face. Just before leaving the happening downtown area, we crossed one last performing artist… a well proportioned young lady in only a golden bodysuit and bright, white wig… frozen in place. Tony C: Yes it is…let’s give her a dollar and see what she does. Tony C: Second thought, let’s get to the car before it gets dark. To read more from Tony C, visit him at Tony C Today and follow him on the twitter at @TonyCToday. Oh, and incidentally – BEST. HEADER PICTURE. EVER. Don’t believe me? Go check it out.